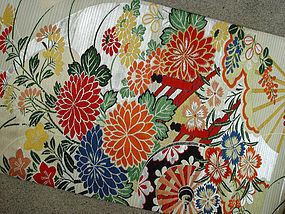 This is the most formal and elaborate style of obi called maru obi. The designs run through the entire obi from one end to the other on both sides. The dimensions: 12" wide x 12'5"(161") long. The cost of making one maru obi is substantially higher than a typical obi. The design here include chrysanthemums, wild flowering plants of autumn, fans and Genji wheel that implies the presence of graceful aristocrats from the Heian period(794-1185). The chrysanthemums by the water (old bridges here) can be translated into one of the lucky symbols. This obi is probably dated from 1910 to 1940. The condition is like new – it doesn’t appear to be used even once.